Wente Vineyards was founded about one hundred and thirty years ago. Based in Livermore, it claims to be the oldest continuously operated vineyard in the United States. Many vineyards did survive the experiment with prohibition in the 1920s. Those that did survive, did so by making wine for communion, one of the few exceptions that the Volstead Act allowed to the otherwise complete ban on the manufacture of alcohol in the US. Wente is still owned and managed by the Wente family. We were recently provided with three bottles of Wente wine. 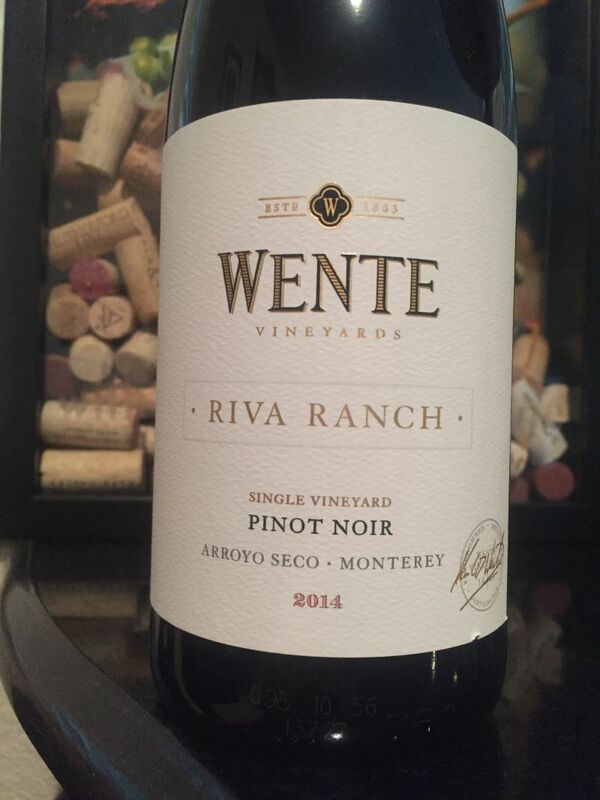 This article focuses on the Wente 2014 Riva Ranch Pinot Noir. This wine is not from their Livermore estate, but from a single vineyard in the Arroyo Seco AVA in Monterey County. This coastal area of California is noticeably cooler than Napa Valley or the Livermore area; making it well suited for growing Pinot Noir. This wine was fermented in stainless steel was then aged for sixteen months in French and neutral oak barrels. The colour of the wine was garnet; a striking shade that my photographs do not fully capture. The nose was instantly appealing, with spice, plum, and damp loam. No one aroma dominated and this was one of those wines where I delayed tasting it so that I could fully appreciate the smell. Taking my first sip I encountered a first impression of a silky smooth mouthfeel. The flavour was of cherry with a hint of vanilla. The fruit components were not overwhelming. The finish left one with an acidity in which those original hints of vanilla strengthened. I paired this wine with a chicken and mashed potato dinner; demonstrating the versatility of Pinot Noir as it works well with white meat as well as more traditional red wine partners. The wine’s acidity working well with the creamy mashed potato. The wine showed the complexity that makes Pinot Noir such a fascinating variety, with fruit and earth, mixed in with the vanilla from the year and a bit in the oak barrel. What the wine did not demonstrate was a well-balanced integration of these components. There was nothing specific to dislike about the wine, but I was slightly underwhelmed; the wine has greater than potential than is on display. 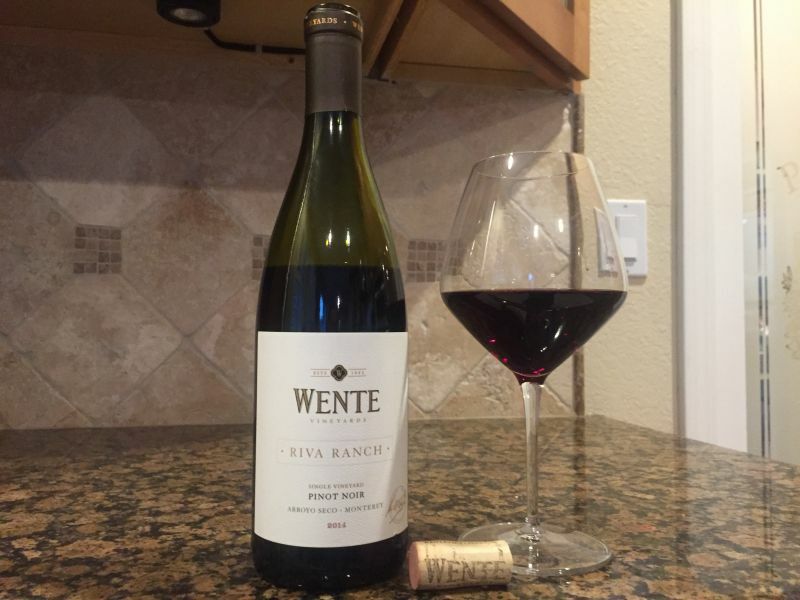 It is a young wine and I think that the elements are present for the Wente 2014 Riva Ranch Pinot Noir to age into a delightful and balanced wine, so I would advise against drinking now; keep it for another year or two. The retail price for this wine is $30, which makes an investment to lay a few bottles down fairly reasonable.